Paper & Wood was founded by Zack Mclaughlin in 2015. He creates dramatically beautiful sculptures inspired by nature from little more than paper and wood. Mainly for private buyers but also for shops and window displays all over the world. Clients include: Jo Malone London, Patek Philipe, Australian Wildlife Conservancy - Sir David Attenborough, Ralph Lauren Paris, Barbour International, Tory Burch, Furer Jacot, Shaun Leane Jewellery, BAFTAs nominees party - Nespresso, DE Beers, Anthropologie, Heaps + Stacks - Regent street W1, Victor Churchill butchers, IFC shopping Mall Hong Kong, Shopping Mall South Korea, Shooter Magazine, Ascot Racecourse among many more. Appeared on: Channel 4 Kirstie's handmade Christmas and ITV’s The Big Audition. Press: The Times, The Observer Magazine, The Telegraph, PaperCrafter Magazine, THISISCOLOSSAL.COM, Viralnova.com, Disney Magazine Malaysia, Evening Standard. Main window display handmade from paper at Jo Malone London on Regent street. Collaborating closely with Thomas-McBrien architects and Jo Malone London Zack helped design and create a handmade paper secret garden within Jo Malone London's Regent street store. 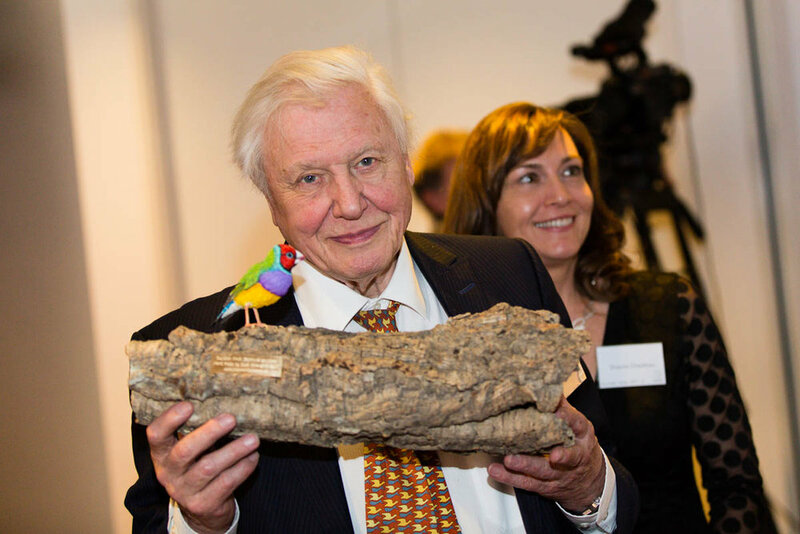 Zack Mclaughlin was commissioned by the Australian Wildlife Conservancy to create an endangered Gouldian Finch out of paper and wood to be presented to Sir David Attenborough at a one of their dinner events. After hand cutting and placing nearly 3000 paper feathers Zack created this window display for Shaun Leane Jewellery which was displayed in His shop front in Brighton, UK. Zack was commissioned to design paper and wood bird themed Christmas decorations for Anthropology for their in store range. Working with Heaps + Stacks Zack created a window display inspired by the Regent street Christmas spirits. This was for a three week pop up gift wrapping and workshop space with Regent street W1. Victor Churchill commissioned Zack to make one of his paper and wood Barn owls to go in their Christmas window display in Sydney Australia. Zack was given the challenge to create a sculpture from Barbour's new lightweight wax jacket material which was displayed in their Covent Garden store in London. Working with Heaps + Stacks and Regent Street W1 Zack created over 2km of paper and fabric snow for the Regent street Winter retreat pop up in the beautiful Quadrant Arcade. Ralph Lauren Paris installed two specially made fantasy paper birds by Zack Mclaughlin in their jewellery window display in Paris, France. 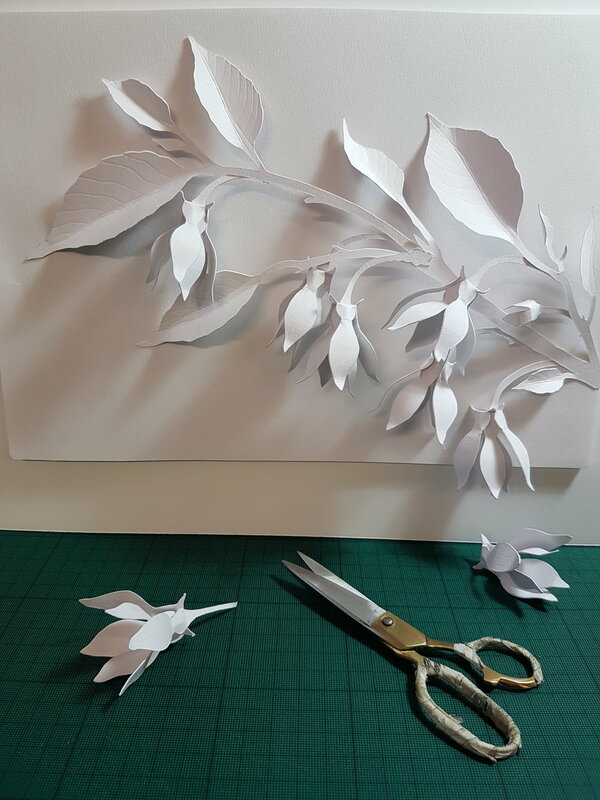 Working for the talented design team at L'atelier Five Zack created 14 paper and wood hummingbirds that were displayed at the BAFTAs Nominees party held at Kensington Palace, organised by Nespresso. Three paper and wood barn owls were made for IFC international shopping mall in Hong Kong to be displayed around the mall with letterboxes for customers to leave their feedback/comments in. Working with L'atelier five Zack created this paper snake that measures over 15 ft long and has well over 2,000 hand cut paper scales all along it's body. The piece was on display in Pressleys jewellery shop in Brighton to advertise Furrer Jacot rings. Details from a sample piece created for a large brand.